Many readers have expressed how great Uncle Felix's manuscript The Villa Verde Trail is. 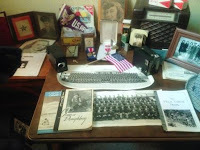 With the help of my sister we have added a new page sharing his letters home and family pictures.This presents a whole different side in how Felix kept the war and his war related challenges away from family. He also repeatedly mentions how import letters from home were to him. If you haven't read it, go back and read his manuscript The Villa Verde Trail first then go to World War II Letters Home for this hero's more personal side. You will never forget this reading experience.